We were delighted to be able to appoint a new Conductor for our choir to take the place of Tegwyn, who retired after seventeen years at the helm, when Rhonwen Jones, a native of Llandderfel Nr. Bala, took up the leadership at Easter 2012. We were looking forward very much to having the benefit of her ability and lifelong engagement with the world of music. We have not been disappointed. Rhonwen is a delightful and determined leader of the choir. Her confident sensitivity, musical competence, and undoubted wit constantly remind us that we are truly fortunate to be under her direction. This is reflected in our growing repertoire and in our competition & concert singing. Rhonwen is no stranger to the big stages. 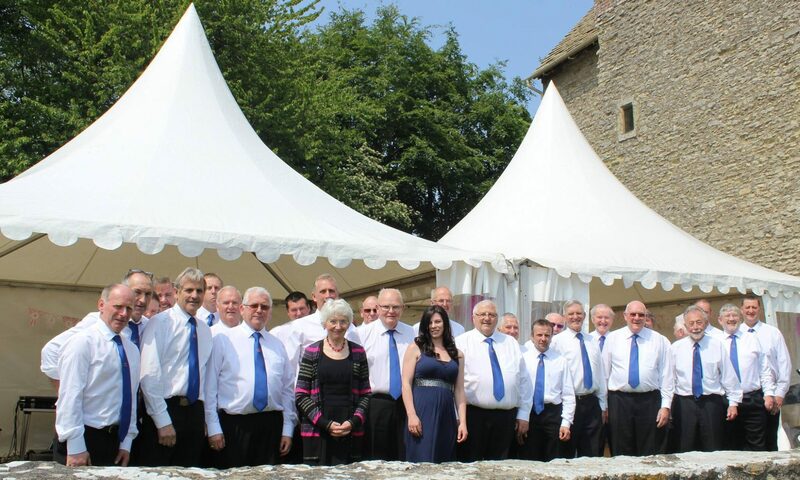 Not only is she an experienced chorister, singing with Penllys and Bro Gwerfyl mixed choirs but she has also made a name for herself singing as a soloist and duettist. She frequently sings solo or is Mrs Olwen Jones’s partner in duets at our concerts. It is a happy thing that both she and Tegwyn, her predecessor, feature together on our list of soloists. STOP PRESS. We have Margaret the new accompanist! More to follow. Christopher has been a member of the choir for fourteen years, having made the decision very shortly after coming to live in the Tanat Valley. While he did not see himself in the role of a conductor, we know that his insights into those awkward part of a piece are always important and perceptive. Chris has committed himself to learning Welsh and deepening his understanding of the culture of Wales. He has been a lifelong chorister and so adds all the wealth of that experience to this new venture we are making together. is from the second tenor section and sings some of the solo parts of particular Choir items such as “The Silver Trumpet”. Gareth is from the bass section of the choir and sings solo pieces such as ‘Bryniau Aur Fy Ngwlad’. Ifan sings in the bass section and sings solos such as ‘Bless this House’, ‘God’s Mercy’ and ‘If I Can Help Somebody’. is our Stage Manager and makes sure that we arrive on stage in good order. makes sure that everyone and everything is in order when Eifion is unable to lead us. is the teasing Irishman in our midst and our concert Compere whose fund of impeccable funny stories sets the scene for what is always an enjoyable occasion. Our Press Correspondents and, when we have a Welsh engagement, Alwyn draws on a lifetime in the world of education when he takes over the role of Compere6. our sales manager looks after sales of our CDs and tapes that are available after each concert. The Choir as a whole makes decisions regarding concerts, trips, joint events and such like during the interval at each rehearsal and we are in that way completely democratic. Our history and geography indicate that we are largely a choir of farmers and rural craftsmen but that does not preclude other occupations. It is a matter of some amusement, when we are introduced, that we could call on the services of a Headmaster, Doctor, Dentist, Banker, Lawyer, a Clergyman, and Undertaker. And yes, we do admit Englishmen! At the moment we are a growing choir and the arrival of new choristers has increased our number to over 40. We are always open to receiving new recruits who are welcomed into the most suitable section for their voice. There is an initial uncommitted period which gives both the Musical Director, and the hopeful, an informal opportunity to assess whether it is wise to continue. It is a great deal of fun – why not give it a try? We rehearse on a Wednesday at the Village Hall, 8pm.